Laryngeal injury from intubation is common in the ICU setting. Longer-duration intubation is linked to higher injury prevalences and severity. At present no guidelines exist for laryngeal assessment and postextubation surveillance. The findings of a new study published in the journal Critical Care Medicine identify targets for future research and highlight the long-known, but understudied, clinical outcomes from endotracheal intubation with mechanical ventilation in ICU. Intubation can cause iatrogenic laryngeal damage. Symptoms include hoarseness, pain, or loss of voice, and may be chronic. Dysphagia can result in aspiration, whereas vocal fold paralysis doubles pneumonia risk. Brodsky MB and his associates conducted a study to systematically review the symptoms and types of laryngeal injuries resulting from endotracheal intubation in mechanically ventilated patients in the ICU. The investigators extracted the data from PubMed, Embase, CINAHL, and Cochrane Library. The systematic review included 7 cohort and 2 cross-sectional studies of 775 adult ICU patients who underwent endotracheal intubation and mechanical ventilation. All patients underwent postextubation laryngeal examination. The mean duration of intubation was 8.2 days. A high prevalence (83%) of laryngeal injury was found. Many of these were mild injuries, although moderate to severe injuries occurred in 13-31% of patients across studies. The most frequently occurring clinical symptoms reported post-extubation were dysphonia (76%), pain (76%), hoarseness (63%), and dysphagia (49%) across studies. The study concluded that a systematic approach to more robust investigations could increase knowledge of the association between particular injuries and corresponding functional impairments, improving understanding of both time course and prognosis for resolution of injury. 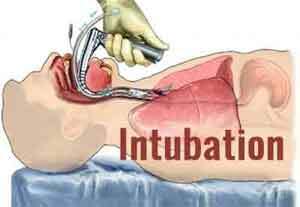 Endotracheal intubation is a procedure by which a tube is inserted through the mouth down into the trachea. Before surgery, this is often done under deep sedation but in emergency situations, the patient is made unconscious at the time of this procedure.